The Ganivet Hotel *** is situated in the historical center of Madrid, close to the major sights and attractions of the city such as Puerta del Sol, Plaza Mayor, the Royal Palace and the Prado Museum, Thyssen-Bornemisza and Reina Sofia . Also, it is in the trendy tapas and restaurants area (La Latina, Cava Alta and Mercado de San Miguel). 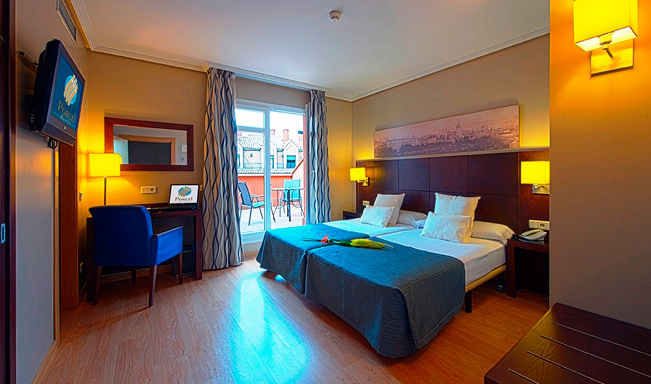 The Ganivet Hotel *** is equipped with the most complete and modern facilities. Its careful design environment combines the classicism of Old Madrid with a trendy and cozy decor. The Ganivet Hotel has 151 rooms, decorated in a warm contemporary style and feature the most modern facilities to make your stay in Madrid a very pleasant experience. 151 rooms on double standard, superior double room with terrace, triple and family rooms. Sightseeing tour through the most important and representative avenues, streets and squares of Madrid to admire its buildings and monuments.The oldest quarter with its densely built streets, constitute what is know as Madrid’s Seventeenth Century “Austrian” quarter where the austere exteriors of its palaces contrast sharply with their luxurious interiors.Eighteenth Century neo-classical architecture is splendidly represented in the Royal Palace, the Sabatini Gardens and “Campo del Moro”, the Alcalá Gate, Paseo del Prado and famous Cibeles and Neptuno fountains. Madrid most modern and avant-garde tendencies are to be found in its newer quarters, with their orderly street layout such as the “Gran Via” built early in the 20th Century, and the “Paseo de la Castellana” ,in turn, which cuts across the city from North to South, is lined by boldly designed avant-garde buildings and crowned by the twin towers known as the Gate to Europe, which have come to symbolise modern Madrid. Get a unique view of Madrid aboard this open-top double-decker bus. There are two tours covering all of the city's highlights, from historical sites and monuments to the modern Madrid of skyscrapers and cosmopolitan architecture. The Madrid City Hop-on Hop-off Tour enables complete flexibility to hop on and off as many times as you like aboard this open-top double-decker bus. With the choice of either a one or two day pass, this is a fantastic way to see all of the major sights Madrid has to offer the visitor.